Jen's life of rebelling and sneaking out is growing stale. In a effort to combat her boredom, Jen makes a bet to turn Trevor, a nice little geek, into a 'bad boy.' She is immediately pulled into Trevor's world of sci-fi movies, charity work, and even-ugh!- bowling. Unexpectedly, Jen discovers that hanging out with Trevor isn't so bad after all. But when Trevor finds out about the wager, all bets are off. Geek Girl is a story about a broken girl who forges an unlikely relationship with the school geek after making a bet. What follows is the complete opposite of what she expected as she learns to trust people for the first time in her life and allows herself to believe that her life can get better. I really loved Geek Girl. Jen is a vulnerable teenager due to her horrible past and being brought up in foster homes where the only reason she was wanted was for the money the family got from the state each month. She doesn’t trust anyone, has low self-esteem and while she wants to be loved by others, she protects herself from letting that ever happen for fear of rejection or having them taken away from her. Jen is stronger than she gives herself credit for, but her lack of self-esteem steams from never having anyone who believed in her. Our adorable geek Trevor is such a sweetheart. He is pretty straight-laced, comes from a good family and treats everyone with respect. When Jen starts to show an interest in him, he is thrown completely off-guard. I love the supporting characters, such as Trevor’s friends and family, and Jen’s foster family. Once Jen lets people in to her life, she slowly learns that not everyone has an ulterior motive, even if she does. Jen’s foster family are good people and are different to the families she usually ends up with, and with the help of Trevor, Jen begins to trust and believe in people again, and herself. 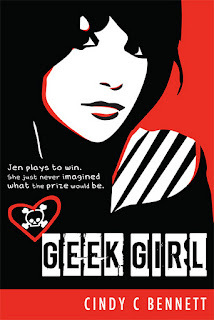 When I first picked Geek Girl up I assumed it would be like the 90’s teen flick She’s All That. But for me, it evolved into something more than just a bet and addressed the real issues of vulnerability that foster kids experience every day. i do like the cover. sounds interesting. I have to admit I also thought it was going to be a book version of "She's All That" but your awesome review has made me very excited to read it!... Adding it to my books-to-read list right now! I was the same as well about thinking it would be similar to She's All That, but your review makes it sound far more awesome. Love the cover, too.